A Happy New Year to all my readers! 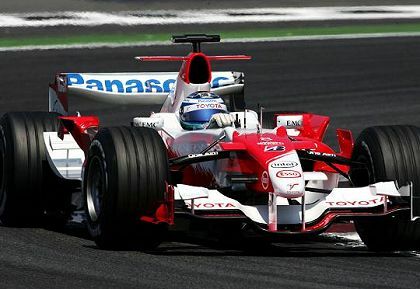 And on this, the first day of 2008, I hear that Tadashi Yamashina, Toyota team boss, has been given two years to bring some F1 success to the Japanese giant. The cynic in me immediately asks, "Or else what?" Presumably it means that Toyota will withdraw from the sport if no breakthrough is made. And that confirms what I have been saying about manufacturers in F1 - that they are here for marketing purposes and will leave if the sales do not flow from their involvement. ING professes to be very happy with its investment in F1 this year, even though Renault have failed to provide them with the success required for full coverage, but there are two additional factors that need to be taken into account when considering the bank's sponsorship. Renault have had a bad year after winning the previous two championships; so they have already increased their visibility to television, forcing some attention to be concentrated upon their fortunes, good or bad. And ING have backed their involvement with a strong international advertising campaign that was bound to provide results with or without F1. It is debatable to what extent F1 has assisted in their marketing drive, therefore, regardless of how happy they are with it. Toyota have no success in previous years to encourage interest in their present performance. And it is likely that their participation in F1 has had very little impact upon their sales. This is an inescapable conclusion in view of the time limit given to Yamashina - the bosses see no benefit rolling in and they need something to persuade them to stay in the game. I have heard it said that just participation is sufficient for Toyota, that they need the market to see them as a company with sporting credentials. But this latest news shows that, without sporting success, the credentials are as good as non-existent. Toyota knows that it needs to win. Can it be done in the time available? The likelihood is that it cannot, especially when we take into account Yamashina's comments. There is some hope in that he mentions organization - and we all know that this has been a prime factor in preventing Toyota from realizing their potential. Yet it is unfortunate that, in the same breath, he says that no one person can make a difference. So it is difficult to see where the design spark is going to come from to provide Toyota with a winning edge. They can build a car that competes for points, they have proved that again and again, but winning requires a little more that they do not seem to possess. And, having produced the design, they are going to need someone special in the driving seat to make the most of whatever potential the car has. I actually approve of the team's decision to retain Jarno Trulli as one of their drivers this year. He is undoubtedly very quick over one lap and so provides a yardstick for his team mate, a way to judge the performance of a new driver. Timo Glock is going to have his work cut out if he is going to qualify higher up the grid than Trulli, and that is the first step towards good results in the races. Yet neither driver strikes me as one who can galvanize a team in the way that a Michael Schumacher or Fernando Alonso can (say what you like about Fernando, he certainly knows how to make the team notice him). Unless Glock surprises me by showing a lot more gumption than I saw in his GP2 season in 2007, it looks as though Toyota have still not found the driver they need. Ralf has pointed out that Toyota made no particular effort to engage Ross Brawn's services; and the rumors of Toyota interest in Alonso turned out to be pretty much without foundation. Which leads me to think that they do not recognize opportunity when it appears and so will carry on down the path they have set for themselves - competence without brilliance. Poor Yamashina has an uphill task, it would seem. I cannot understand why Toyota are in Formula One. They seem to lack passion, instinct and ability. And they have very little to show for the five years they've been competing. Not even increased sales, presumably. Many people moan that if you can't afford to participate in F1 competitively, you shouldn't (recently harked in Minardi's direction). I disagree because Minardi had immense passion. But where this opinion does apply is with teams that do have the funds but still can't succeed. In my opinion, 2010 cannot come around quick enough. I think it's a terrible shame, Ollie. I can remember the hopes we had when Toyota first arrived and how we expected their financial muscle to ensure that a new team had arrived to add to the mix at the front. The ensuing years have eroded that hope so that now we doubt that the team could ever be a serious threat to the best of F1. It seems such a waste to me and I don't really look forward to the team's likely departure from the sport. F1 needs diversity and different approaches to the task of winning. It's just a pity that Toyota's methods don't work and the best that we can hope for would be some sort of merger between the Toyota and Williams teams. This is where a US GP is important for teams like Toyota. If they found increased sales in the USA then that might be enough to persuade them to stay in F1. Bernie really needs to have a think about that. A "perilous" thought indeed, Peril. And one more reason why the FIA should be making it easier for new teams to compete in F1. They seem terrified of a repeat of the Andrea Moda fiasco and yet, when it comes down to it, that was an amusing aspect to the sport, a bit of fun that did no harm and kept a smile on a few faces. Surely that is preferable than degeneration into a situation like sportscar racing where one or two teams dominate and everyone else gets fed up and goes home (including the fans)? I still suspect that Toyota haven't even learned from their mistakes in the small enough way that blaming the methodology instead of the leader would imply, and will simply swap Yamashina-san for some other luckless Toyota executive come 2010. It is a case where the team cares more for its reputation than for its effectiveness. Yes, Toyota, your cars are meant to go as fast as possible round wobbly, continuous loops of tarmac, not just communicate the core principals of the organisational enterprise in an illustrative manner (or something like that). In mistakenly placing reputation over effectiveness, it is eerily similar to the FIA. It worries about attracting manufacturer prestige and outside approval for all its major series, yet it does not necessarily take the sort of actions that would make it good at those series' actual purposes and garner lasting praise from outside. As a result of missing the fundamental purpose of its role, it fails in even the area in which it appears to be placing most effort. Toyota will be in the FIA's F1 for a long time. Their shared errors in thinking ensure that it will remain one of the most ironic pairings in motor sport - and that both will continue to fail in similar ways. Oh, Toyota has a lot of money, but it also has a lot of inertia. Accounting for accountancy is very complicated - all it takes is a clever story from the right people and the accountants will stop arguing with you over whether the spending is on the right areas. It's only when there's too much spending overall that they exert their (massive) power. Cleverer talk will even convince the leadership that the F1 project is wonderful and self-justifying. The only thing that will truly cause Toyota to pull out is that the gradual erosion of the department's prestige will cause less-efficient people to be assigned to advocate for its existence. Eventually (it will probably take a decade or so), someone will be appointed who is sufficiently poor at the advocacy side to say something allowing the F1 project to be ended with perceived internal dignity. Then Toyota will leave, considering its objectives complete (though not perhaps the ones it originally set out to complete). The rest of us will still be wondering why it didn't just put those resources to use doing some good, basic racing. You have to question the logic of a company that has failed to deliver but thinks there is value in investing millions in track upgrades so that the Japanese GP is not at a Honda track. I would like to think that if I was running Toyota I would have taken all the money that was invested in Fuji and given it to Ross Brawn, Adrian Newey or Mike Gascoyne and told them to deliver results. They tried Mike Gascoyne before... ...and then fired him for arguing with the faulty logic of the Toyota approach to F1 once too often. It seems that Toyota are too sensitive to criticism to learn from their mistakes. Pink Peril: I think Toyota is trying to find their American market in another theater. Which may have something to do with the 2 year deadline? Are they thinking NASCAR could expand into other markets within the next 4-6 years and securing a spot in that vanguard while upholding a presence in the F1 market hedging their bet? If they have success they stay, if not they don't lose much by going. Yes, Clive, I know its a sport and that's supposed to be the first point but cynical me, I'm afraid that when F1 became a predominantly manufacturer's game it became a marketing tool for all of them...and maybe a developement one as well. Any corporation flinging this sort of cash at anything surely has an eye at the r & d aspect as well. I agree, though, it is the reason the FIA should welcome new teams and try and sort out some money arrangement that will encourage their entry on a competitive level. It would make it more sport and less business. I think I know why Toyota is NOT going for the Ross Brawns and the Fernando Alonsos. Toyota want to win because they ARE Toyota. Because they follow THEIR Toyota way. Not because they got some formula for instant success (which is what Brawn, Alonso, and Michael Schumacher - not Ralf - surely are). For them, if they win with such personalities, it goes against the entire grain of the Toyota way - that no one person is bigger than the entire team. Look at Gascoyne. When he started to mold Toyota into his own, he duly got the boot. Gascoyne is just one part of Toyota, nothing more. When he started becoming TOO vital, they let go of him before he eats up the Toyota way and spits it out as something that WILL NEVER work in 1950s F1, let alone modern F1. And ultimately, that will be their story, their legacy, their tragedy. Need more proof? Look at their NASCAR foray. Same procedure, same results. It may change in 2008 (with their partnership with a major frontrunner), but as of 2007, it's been a total disaster. Nuff said. Verasaki - do Toyota participate in NASCAR? Forgive my ignorance, as NASCAR is not widely covered here. In fact the only reason we ever hear of of it nowadays is because there is an Australian racing in the series currently (gotta love that parochial media ! The only time we get F1 news is just before the Melbourne GP, or if Webber does something noteworthy). But I was under the impression that NASCAR was all Chevy's and Dodges? US manufacturers anyway. I know that Toyota have been trying to break into the Australian touring car series here (called the V8 Supercars), which is only between two Aussie manufacturers - Holden & Ford. But the powers that be have been veeerrrryyy resistant to that move for some reason. That is a very clear insight into Toyota's thinking, Journeyer - I think you're absolutely right. It explains so much of their history in motor sport and shows that their F1 foray is bound to fail. I only wish that I could have understood that when they first arrived in F1 - it would have saved a few hopes and dreams. There's an Ozzie in NASCAR, Peril? But the driver with the best name for a driver ever, outdoing even Scott Speed, is an Australian - Will Power in Champ Cars. He must surely be champ one day! I agree, Will Power is the best name ever ! And with Bourdais out of the picture, you'd have to think that Power is one of the favourites to be champion. The Aussie in NASCAR is Marcos Ambrose - he has been driving in the Bush Craftsman truck series, but I beleive he has graduated to the tip tier now. I'm not too sure - I couldn't stand him when he raced in Oz, so I don't really follow too much what he is up to Stateside. I'm more interested in what Montoya is up to. Somebody please tell Pink Peril that Toyota spent five years trying to get a Camry into the Nextel Cup, I think they finally got in about three years ago; I lost count. Toyota I believe still have a fairly dominant (as much as anyone can dominate a series as flat as Nascar) team in the Craftsman Truck Series (lowered pickups, yay...) and turned that into their effort with the Camry. Frankly, a part of me thinks Hyundai Sonata and Honda Accord entries belong in Nascar as well, to complete the parade of US-available four-door family sedans. I'm not proud to know any of that stuff, it just comes on TV all the time.